To measure liquids, you should always use liquid measuring cups and spoons. Liquid measuring cups are usually glass or plastic, and most have a spout for pouring. Avoid dry measuring cups when measuring liquids because they will not be as accurate and could make a difference in the outcome of a recipe, which is especially important for baked goods. A liquid measuring cup will almost always have measurements in cups as well as fluid ounces. Remember that the fluid ounces are not necessarily the same as ounces; fluid ounces are a measurement of volume while ounces are a measure of weight. Depending on what type of recipe you are making, a liquid ingredient called for may be listed in a measurement you are not familiar with. For example, the recipe might say "4 fl oz. milk" when you are used to measuring in cups and tablespoons. Luckily, there is an easy conversion for the varying measurements. By referring to the chart, you will see that 4 fluid ounces equals 1/2 cup. Gallons, quarts, pints, cups, ounces, and teaspoons and tablespoons—there are a lot of different ways to measure liquids. And although there are some simple conversions to easily go from one type of measurement to another, it is not always easy to remember it all. Keep this chart handy and you will be able to make the necessary switch in no time. 1/2 fl. oz. 1 Tbs. 3 tsp. 1/8 c. 1 fl. oz. 2 Tbs. 6 tsp. 1/4 c. 2 fl. oz. 4 Tbs. 12 tsp. 1/2 c. 4 fl. oz. 8 Tbs. 24 tsp. 1/4 qt. 1/2 pt. 1 c. 8 fl. oz. 1/2 qt. 1 pt. 2 c. 16 fl. oz. 1/4 gal. 1 qt. 2 pt. 4 c. 32 fl. oz. 1/2 gal. 2 qt. 4 pt. 8 c. 64 fl. oz. 1 gal. 4 qt. 8 pt. 16 c. 128 fl. oz. If you are making a recipe from a country that uses metric measurements, such as Britain and India, the ingredient list may look a little foreign to you. 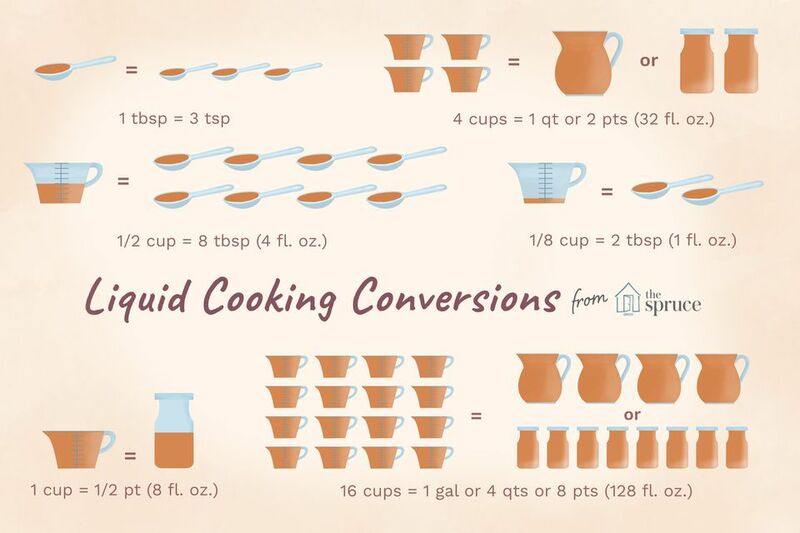 Instead of struggling and second-guessing, simply convert the liquid metric measurements to fluid ounces, and then if need be, convert to cups, tablespoons, or teaspoons. The conversions are rounded to the nearest whole number; for example, 1 fluid ounce is 29.57 milliliters, but for simplicity sake, we will say 30 milliliters. 15 ml. 1/2 fl. oz. 30 ml. 1 fl. oz. 59 ml. 2 fl. oz. 118 ml. 4 fl. oz. 237 ml. 8 fl. oz. 473 ml. 16 fl. oz. 946 ml. 32 fl. oz. 1.9 L. 64 fl. oz. 3.8 L. 126 fl. oz. In addition to using the right measuring tool when you are measuring ingredients, you also need to follow a few steps to make sure you are measuring correctly. First, make sure that the liquid measuring cup is set on a flat surface; you might be inclined to hold it at eye level, but you may not hold the actual measuring cup level and risk measuring incorrectly. Once you place the liquid measuring cup on a counter, bend or lean down so you are eye level and can clearly see when the liquid has reached the correct marking on the side of the cup. Measuring spoons, made to measure both dry and liquid ingredients, are not as accurate for liquid ingredients. However, since measuring cups don't measure such small increments, measuring spoons must be used for teaspoons and tablespoons of liquid (or, in most cases, anything under 2 fluid ounces). To get the best measurement, be sure to fill the measuring spoon right to the rim. What Can I Use to Substitute for Eggs in a Recipe?